Russia said it would also withdraw permission for Britain to open a general consulate in St. Petersburg and would close the British Council, an international organization for cultural relations and educational opportunities, in Russia. The announcement comes three days after British Prime Minister Theresa May's decision to kick out 23 Russian diplomats allegedly operating as undeclared intelligence officers in Britain. The expulsions — the largest in three decades — "will fundamentally degrade Russian intelligence capabilities in the U.K. for years to come," May said. On Saturday, during a speech delivered to the Conservative Party Spring Forum in London, May said the U.K. takes no issue with the Russian people but threats to the lives of British citizens would not be tolerated. 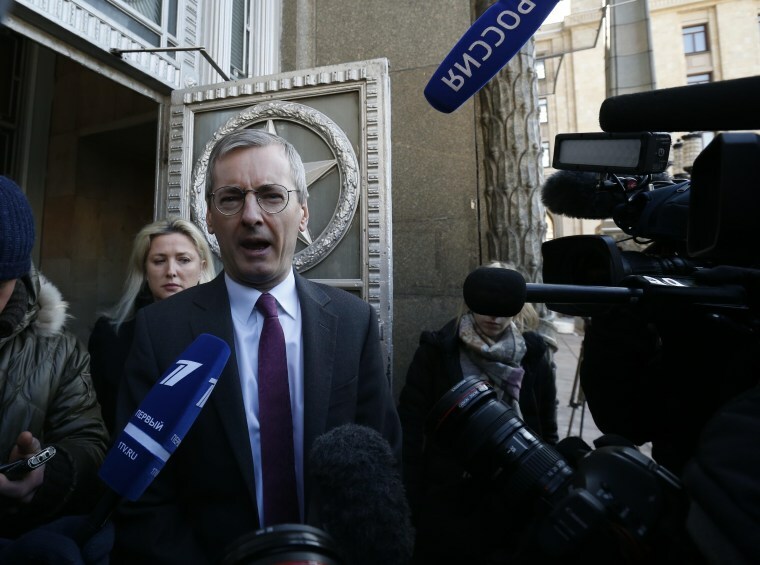 She said that the British ambassador to Moscow had been informed by the Russian government of the measures Russia is taking in response to "the suspension of all planned high-level contact between the UK and the Russian Federation." "In light of their previous behavior, we anticipated a response of this kind and we will consider our next steps in the coming days, alongside our allies and partners," May said. "But Russia's response doesn't change the facts of the matter. The attempted assassination of two people on British soil, for which there is no alternative conclusion other than that the Russian state was culpable. It is Russia that is in flagrant breach of international law and the Chemical Weapons Convention." The Russian measures against Britain are the latest development in a standoff between the two countries over the poisoning of Sergei Skripal and his daughter in the English town of Salisbury last week, which has seen diplomatic relations reach a post-Cold War low. Addressing the U.K. parliament on Wednesday, May laid the blame for the attempted murders squarely at Russia's door. "There is no alternative conclusion other than that the Russian State was culpable for the attempted murder of Mr. Skripal and his daughter — and for threatening the lives of other British citizens in Salisbury," she said. The Russian Foreign Ministry said in a statement that the expulsions were in response to "the provocative actions of the British side and the unsubstantiated accusations against the Russian Federation in connection with the incident in Salisbury." The ministry warned that it reserves the right to take other measures against Britain in the event of further hostile steps from London. The British Ambassador Laurie Bristow, who had been summoned to the foreign ministry Saturday, said he had been informed of the retaliatory measures. On leaving the meeting, he told reporters that the use of the chemical agent was not only an attack on the U.K., but on "the international world's base system on which all countries including Russia depend for their safety and security." The ambassador said that Britain had given Russia the opportunity to explain how a chemical weapon developed in their country was used on U.K. soil and to declare the material to the Organisation for Prohibition of Chemical Weapons, but that Russia had done neither. "This crisis has arisen as a result of an appalling attack on the United Kingdom," he said. "We will always do what is necessary to defend ourselves, our allies and our values against an attack of this sort," he added. A spokesperson for the British Foreign Office said Saturday that the onus remained on Russia to account for its actions and to comply with international obligations. “In light of Russia's previous behaviour, we anticipated a response of this kind and the National Security Council will meet early next week to consider next steps," the spokesperson said. "Russia's response doesn't change the facts," the spokesperson said. "It is Russia that is in flagrant breach of international law and the Chemical Weapons Convention." Speaking later on Saturday May said Britain would consider its next steps alongside its allies in the coming days. "We will never tolerate a threat to the life of British citizens and others on British soil from the Russian Government. We can be reassured by the strong support we have received from our friends and allies around the world," May said. British Foreign Secretary Boris Johnson said Friday that it was overwhelmingly likely that Russian President Vladimir Putin himself had made the decision to use the nerve toxin on U.K. soil. "We have nothing against the Russians themselves. There is to be no Russophobia as a result of what is happening," Johnson told reporters. "Our quarrel is with Putin's Kremlin, and with his decision — and we think it overwhelmingly likely that it was his decision — to direct the use of a nerve agent on the streets of the UK, on the streets of Europe for the first time since the Second World War," he said. Russia has denied any involvement and said it was not responding to May's earlier ultimatum until it received samples of the military-grade nerve agent Novichok, which British investigators say was used in the attack. “All the responsibility for the deterioration of the Russia-U.K. relationship lies with the current political leadership of Britain,” it said in a statement earlier this week. The expulsions came a day after British police launched a murder investigation after an autopsy revealed that a Russian exile who was critical of Putin was strangled in his home. Nikolay Glushkov, whose body was found Monday, died as a result of “compression to the neck,” London's Metropolitan Police said in a statement.